Lately Elliot has an uncanny ability to notice unusual birds as we go about our business. On Saturday while driving down Stone Street, he spotted this young hawk far off in the distance. With no traffic, he could easily back up so I could take a photo. Hawk has been a special messenger for me for many years. His appearance seemed deliberate as he was not airborne but perched on a fence. My camera lens bounced as I tried to zoom in, asking the angels for help. When I finally located him, he had his feathery back to me. I'm familiar with a hawk's call, but this was the first time one responded to my whistle. Curious, he turned to see me. Whenever a particular animal crosses our path, it helps to notice the behavior. 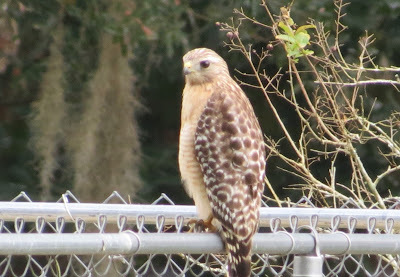 This young hawk was "on the fence" waiting patiently, indicating a time to be vigilant for opportunities that will present themselves "on the ground". Hawks are universally recognized as guardians and messengers. The appearance of hawk heralds a time of greater strength and vision which will help in our present endeavors. In Animal-Speak, Ted Andrews writes: "The sky is the realm of the hawk. Through its flight it communicates with humans and with great creator spirit. It awakens our vision and inspires us to a creative life purpose."